Garegar orbits a main sequence star, called Sarkek. The system contains a "hot Jupiter", a gas giant that orbits extremely close to the star. This one is known as Sarakaar, the antagonist of Tuskoraptor religion. Sarakaar is known as the fallen brother of Sarkek. This gas giant can cause eclipses, and due to its proximity to the sun, which in ancient times was thought of as a duel between the god of light and order and the god of darkness and chaos. The eclipse looks spectacular when observed through observational devices. The planet is tidally locked and one side always faces the star. Two moons, Sara and Kaar, orbit it, named after the twin aspects of the god, that of darkness and that of chaos, which are said to manifest separately to his followers or those he wished to corrupt. Next follows the asteroid belt, which in later years provides the Tuskoraptors with bountiful mineral resources. The comes Garegar, the homeworld, no moons. Seroo, named after the wandering god of wilderness, is a desert world, no native higher life-forms, though native plant life and insects exist around the few water sources, scientists believe the world was once lush in the distant past, but began to dry up long before Tuskoraptors sapience. Recent discoveries dug up some artificial artifacts. Tuskoraptors would spend many hundreds of years debating whether sapient life had evolved on Seroo before the drying, or alien visitors had left the artifacts. One green fertile moon orbits. It is to Tuskoraptors what the Caribbean is to humans, with some zoo's safari's, and general leisure facilities. 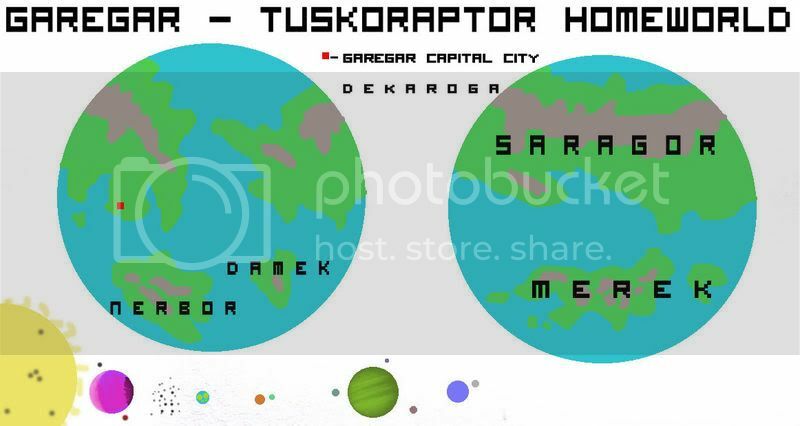 Seroo and the moon, Reken, were the first worlds to be visited by Tuskoraptors when they entered the space age. Demor is the largest planet in the system, a gas giant, it is named after the son of Sarkek, over-god. Demor was charged with the responsibility of caring for the order of the world and the heavens much as a Sheppard must watch over his flock of sheep. In mythology he is said to ensure all the stars are ordered and follow their respective pilgrimages across the heavens. He is also responsible for ensuring the other gods pay homage to the creator by dancing around him in great paths, even Sarakaar could not resist the will of over-god and great son, and so when not "battling" the over-god, he must also pay homage, though it is mere lip-service. The three moons of Demor are named after the three daughters of that god, Deme, Moren and Soorp. The last world is a smaller blue gas giant, named Demeresh, the wife of Demor. Demeresh was said to dwell beyond the confines of the world, caring for the departed souls of Tuskoraptors and other ethereal minor dieties, as her creations she longed to be with her children, the tuskoraptors, and it is said the first stars were tears wept from her grief to watch her children grow in life. She couldnt abandon the children that returned to her, and so she felt conflicted. When she married Demor, he convinced his father to take the souls of her children in his arms, and so she was free to enter the world and watch the Tuskoraptors with her own eyes. But Sarkek had made a condition, she would have to remain with her husband in the heavens, and assist him for eternity in maintaining order there. The moon of this planet is called Haarik. Haarik the god was son of Demor and Demeresh, who was said to have walked amongst the Tuskoraptors of Garegar often. He was said to have been a great warrior who fought the minions of Sarakaar often, eventually he was tasked with patrolling the edge of the world and heavens, blocking the way for the dark dieties and servants of Sarakaar. It is said that when the over-god judges a soul to be bad, it is greeted by Haarik, who himself ceremonially banishes the lost soul from the confines of the world through the eternity gate. 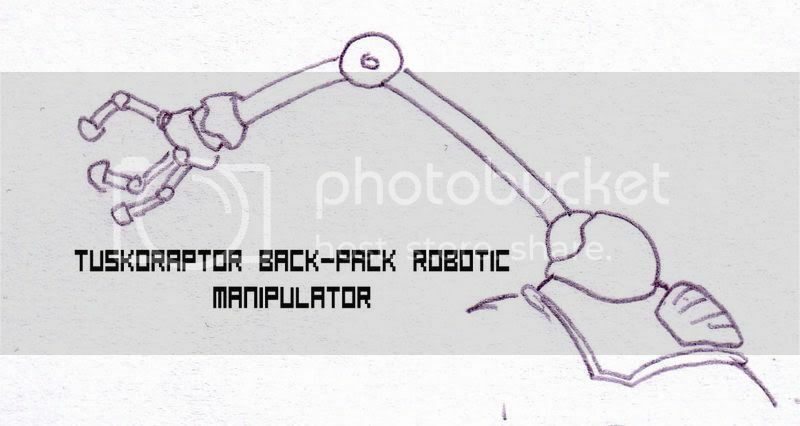 This is a Tuskoraptor backpack robotic manipulator. following understanding of more advanced robotics, this device became widely spread. For dangerous activities, for scientific research, labour, construction, it became as wide-spread and used as the human car. It also allowed for the first time for Tuskoraptors to have two manipulators each individual, meaning tasks specifically requiring two tuskoraptors now only needed one. Some traditionalist politicians and old folk said the manipulator was cheapening a very important social unit, that of a traditional work team of two tuskoraptors. Many tuskoraptor families were created from a male and female tuskoraptor being paired to work together, and some believed the new technology would threaten not only ancient tradition, but one of the main ways tuskoraptors paired off. Fortunately this was never the case, the traditional Rekar "work team" was still kept, but now they became more efficient with 2 sets of manipulators instead of one. Edit: The lines aren't smooth because I don't have a graphics tablet, and the colouring is a big dodge because of the pencil work underneath. Sorry if its bothering anyone. Nice, the mouth piece is influenced by Hugg and Hydro’s creature editor? so many ne cretures latly and all of them with artist whose skill can already pass my own. this is freaking sweet! Aye, the creature editor is pretty handy, just getting a blob into something remotely shaped, after that, you refine it, and stuff. In a sense I guess a little credit goes to the Editor guys. Edit: Yes, I appreciate that by being reptiles with roughly standard reptilian layout they could be considered "another stupid dragon" species. man, I need to revive my creature...I'm so lazy though, and I have nothing to say... I need inspiration. Thanks, praise from you guys makes me know I'm onto something right, and motivates me. 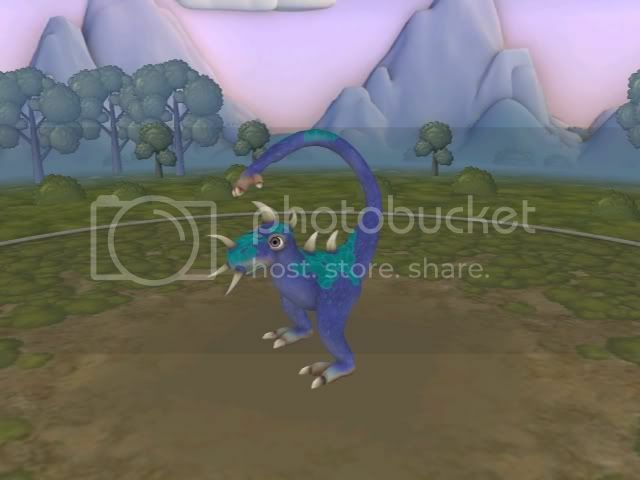 As for your creatures, I don't really know the link now, but you could download the creature editor, use it to just toy about. For me this is a very old creature that I made up while fiddling with the editor ages ago, only now have I done it. From there its pretty easy to make up all the back story, its all made up on the fly (like procedural generation ) the solar-system was just made up on the spot, the planet, well it wasn't hard, I've made much more complex maps, I should probably scan them in (and take the scanner down to my computer) and use them for my species, but meh. So yeah, I find the best way to make stuff up is to not think about it too much, just create your creature, then make it up as you go along, and just remember to maintain consistency with what you've already made up as you go along. The Kor Toban unity arose from a small tribe that dwelt in the warm temperate region around its capital (which would remain an important city ever after, eventually becoming the planets capital). The Kor'Toba tribe were originally barterers and traders, but this wealth often attracted the unwanted attentions of some neighbors, eventually leading to a large horde of nomadic barbarians seeking to invade the tribe's lands and pillage their villages, and take slaves. The tribal elders initially commanded their villages to take what they could and prepare to leave, and to escape westwards to other friendlier tribal lands, and out of the path of the north-eastern nomads. 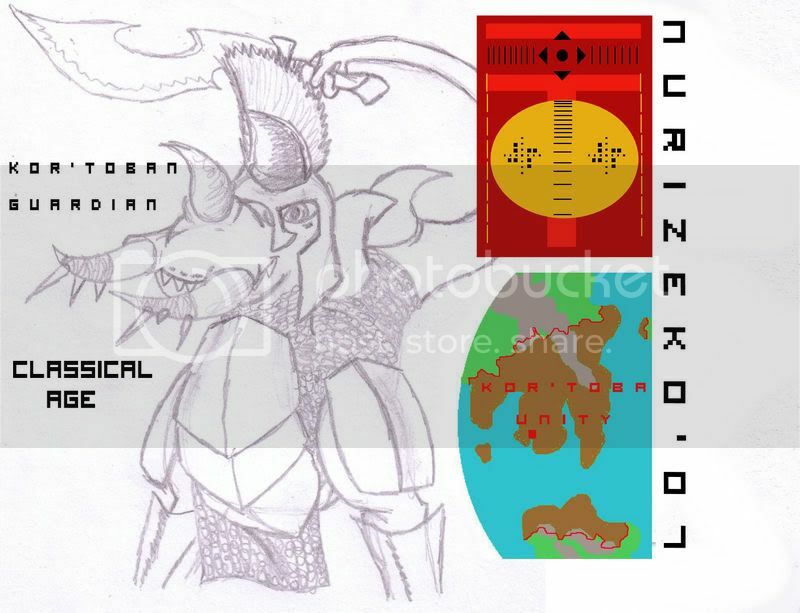 The great Garan Sartok convinced his tribe that they needed to prepare for the inevitable storm to come. For he knew that if the settled tribes continued to run, they would eventually face the sea, and there, all the achievements of his people and their allies would be lost for nothing. Under his supervision his tribe prepared their defenses, and trained ceaselessly, the blacksmiths worked day and night to prepare the armour and armaments the tribe and their allies would need. While his tribe prepared, Garan used his diplomatic skills to convince his neighbors that if they didn't make a stand here, they may lose the chance to ever stand together against the barbarians, for if they fled, the settled tribes could have been too scattered. At the foot of Demor's throne, a mighty mountain surrounded by the lowland plains, the unity army stood, their swords glinting, their armour shining and the dyed hair crests on their helms burning a vibrant crimson. Garan, raising his blade, look towards the approaching horde, on their mounts. Garan upon his mount looked the very image of heroism, truly this was Haarik incarnate, or at least blessed by the god warrior. as the Horde drew closer and closer, Garan looked towards them in silence, his face full of determination, as strong and un-wavering as the great mountain. With a roar, he led his most bravest and trusted tribal warriors in the initial charge, he would face his enemy in open assault. Of the individual deeds of courage and refusal to surrender ground that day, would be too long and many to recount, suffice to say the settled tribes seized that day, and with agreement to absorb the neighboring settled tribes into Kor'Toba, the great Unity was created. The following centuries would see the Unity spread over a vast region of the world, engineering, warfare, politics, all aspects of the tuskoraptors life would be touched by the advances the unity brought. Of course the Unity also had its dark sides, slavery, and eventual militaristic wars against the innocent, but overall the unity is remembered amongst Tuskoraptors as one of the most influential empires on history, and a milestone in advancement. For a long time after its collapse the unity would be considered the height of civilization and the aspiration for all aspiring empires. The Guardian was the sword and shield of the unity, it was the heart of every unity army and garrison. They soon became known for their steely determination to fight and push forward, for every step back an enemy took the guardian sought to take two. In many battles the sight of a regiment of Guardians would be enough to finally convince a rebel leader or enemy tribal chief the folly of his ways, and cause him to surrender. The guardians reputation was well earned, unfortunately as the final years of the unity approached, guardians began to be used for political ambitions of unity leaders, and for civil conflict, and as the unity began to decay, the quality of arms and training of guardians began to degrade. By the fall of the unity the guardians were down to 7 regiments, thinly spread across the territories, and their quality was greatly reduced. Auxiliary forces and mercenaries made up the bulk of the unity's shriveled armies, and would eventually prove to be unreliable. this bring up the question, what weopons do they use and have they figured out space travel. Yeah i was going to say. It looks like i drew some of it. LOL And no problem I am glad it helped ya but don't depend upon it too much. You have some artistic tallent an should try to draw it all on your own next time. Tuskoraptors have had many varied weaponry throughout their history, for it is to be noted that tuskoraptors were an extremely martial species for the early thousands of years of recorded history. This has puzzled experts for a long time, since in later years the Tuskoraptors have shown themselves to be well ordered and civil disturbance to be rarer then their past would suggest. It is also true that historical records and study has shown them to prefer peaceful existence, when possible, as most intelligent socially developed races. Some would argue due to their predator past, along with the other dangerous wild-life of their pre-sapience infancy, would have lead to part of their martial nature remaining. 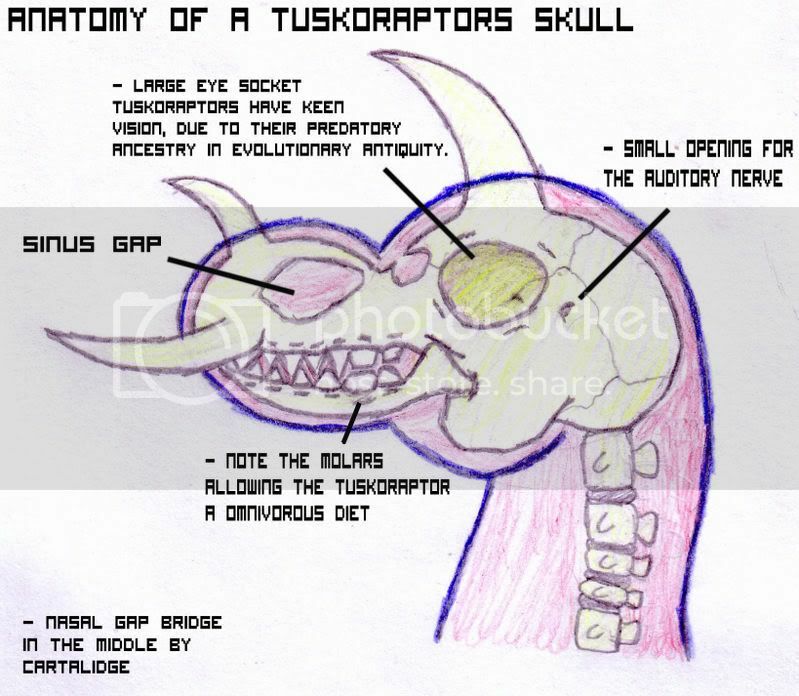 Tuskoraptors have had many weapons as such, spears, slings, even basic clubs, above imaged are the most common weapons at the height of classical Tuskoraptor warfare. Pi'Ker sword: The Pi'Ker sword was the most common bladed weapon of warfare for many centuries, it was well balanced, light, with a fine strong edge. Pi'Kers came in many variants, from the extremely ornamental ceremonial ones that were so cherished that they would never be dishonoured by having blood spilled upon them, to the cheaper most basic practical forms, that many Tuskoraptors would never leave home without. Many Tuskoraptors families for centuries, and even thousands of years afterwards, into years where warfare and the need for such weapons were long distant dusty memories, would have an ancient family Pi'Ker blade on show in the main dwelling room, often accompanied by an eager grandfather passing on the story of the original owner, a long distant ancestor. Tuskoraptors often took pride in having such an old relic of their family's history, and if a Tuskoraptor was mentioning it, he wouldn't hesitate to list the famous battles it was involved in. 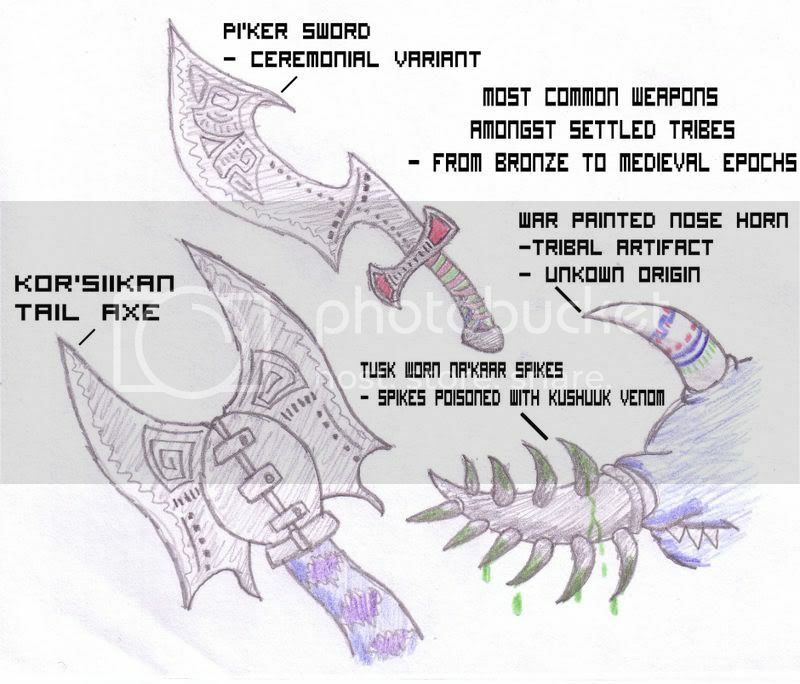 Kor'siikan tail axe: A popular weapon, this weapon required the help of another Tuskoraptor to put on, and many generals and tribal chiefs often chose this weapon as the main armament of their forces, to promote comradeship amongst their men. While never as widely famed and honoured as a Pi'Ker, it was a reliable and good weapon, turning the Tuskoraptor manipulator into a potent weapon, making the axe as if part of the Tuskoraptors body. The markings were for some kind of spiritual protection, to defeat the defenses of an "evil" opponent, or to offer the wearer a level of spiritual protection on top of their conventional armour. Many Kor'Siikan axes were plain and un-decorated, as they were mostly seen as a cheap practical weapon. Some however were made quite ornate and decorative, by wealthy fans of the weapon. Only a few original examples existed beyond the height of their usefulness, in museums and personal collections. 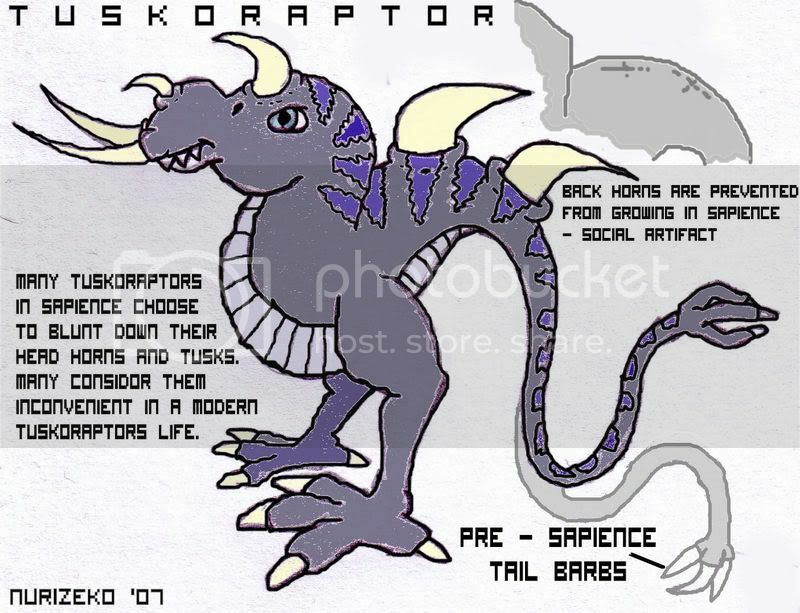 Na'Kaar spikes: Due to their physiology, Tuskoraptors sometimes felt they needed an "up-front" deterent and offensive tool, since despite their prowess in combat, the Tuskoraptor form essentially left the bulk of their body more exposed then a forward limbed creature. The awnser came in the form of the Na'Kaar spikes, worn over the tusks, with spikes along its length, this weapon provided the wearer with the ability to exploit openings and lunge at the enemy and cause severe flesh wounds. This made the formidable tusks even more of a danger to an opponent. Many Warriors would cover the tips of the spikes in a potent poison, since a quick strike could cause the enemy to slowly lose their combat effectiveness, and then disable them as they became paralyzed. Leaving the wearer to escape, finish the job easier, or even grant mercy and take the opponent prisoner without a struggle. This weapon would remain in usage well past the classical age of warfare, acting as the Tuskoraptor version of the human bayonet. War painted horns and tusks: The ritual painting of the tusks and horns dates back to pre-history, which were believe to be some form of spiritual protection, as well as giving the wearer spiritual strength and power. The phenomenon persisted well into the classical age, but by then it had lost most of its meaning, merely becoming a traditional act of a warrior preparing for battle. chiefs and generals and the wealthy would often have extremely elaborate nose horn decorations, as a sign of standing and rank and importance. Kushuuks and Tuskoraptors share a common ancestry from many thousands of years ago. Kushuuks are small reptilian predators, mainly consuming large insects, fish, and other small animals. They prefer to live in grasslands where they have some cover. They are very fast and can escape detection or capture very well, but they have evolved a poisonous barb flail on the edge of their "nose" if they feel cornered and trapped. The venom is potent but merely paralyzes pray and predator alike. Their horns are quite impressive for a small creature, and they also have tail barbs to kill their prey, but their muzzle tusks have become little more then small protrusions that barely break the skin, and are quite blunt. They are brightly coloured as a warning to potential predators and their large foot spans help them balance well. Some adventurous Tuskoraptors enjoy keeping them as exotic pets, and they had a use throughout history as a source for their venom, which some weapons were covered in. For a brief period they were also considered quite a delicacy on the island of Damek. The Kushuuks of Damek were almost entirely red and larger, and their venom was also stored within some organs, as such, a Tuskoraptor chef had to train for 7 years before he could be licensed to serve it, as causing restaurant guests to collapse in paralysis wasn't a desired occurance at expensive restaurants. Kushuuks for consumption fell out of favour as other dishes became in vogue. 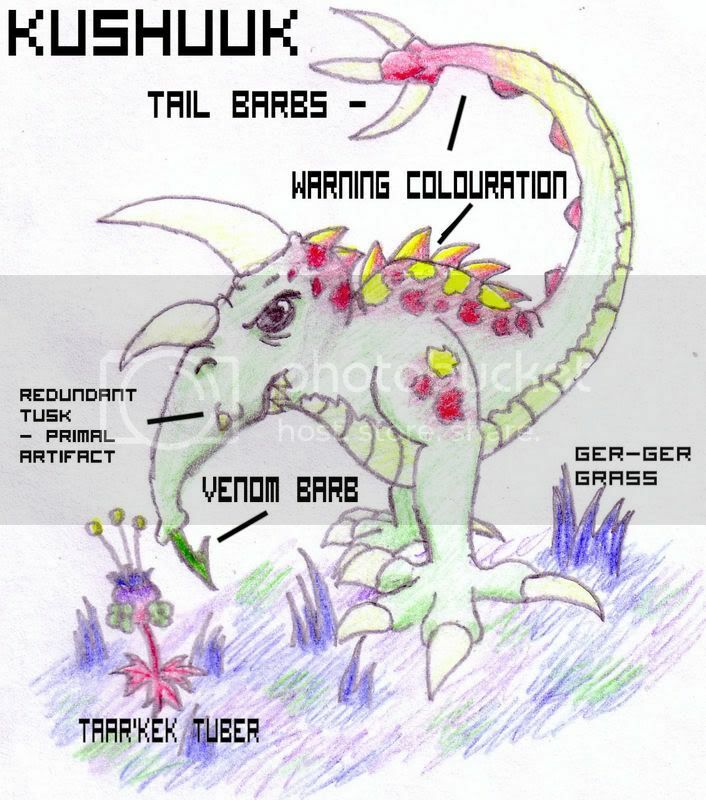 Kushuuk venom was also used as an extract was used in sedatives in Tuskoraptor medicine. There was also a sports team, called the Wild Kushuuks, who were popular for a time. 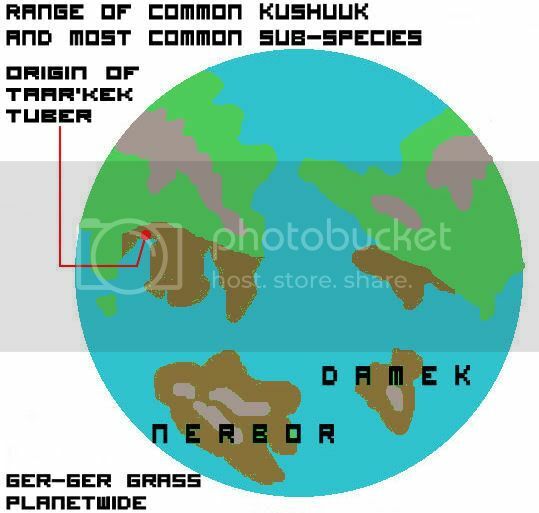 The Taar'Kek tuber was a common plant found in the eastern regions of Saragor. their tubers became stable foods for many Tuskoraptors, and were domesticated early on, and remained a food source for Tuskoraptors ever after. Ger-Ger (pronounced:grr-grr) Grass was a widespread mid-growth grass that covered many areas of the planet and formed the primary plant species of many grasslands. when bounded small plots of land became fashionable accompaniments to dwellings, a popular land use was cut and well maintained coverings of Ger-Ger grass, with taller decorative plants surrounding the grass area.